Home Bloggers Learning Sign Language has opened up a whole new world! Learning Sign Language has opened up a whole new world! This week marks BDA’s Sign Language Week… a time to come together to celebrate and recognise a beautiful language; that is British Sign Language (BSL). I’m profoundly deaf, my preferred method of communication is speech and lip-reading. I’ve been learning BSL for the last two years and it’s one of the best things I’ve done. I was born into a hearing family who chose to teach me to speak. It was the best option at the time and Sign Language wasn’t suggested to my parents then. I suppose if all else failed with speech, they might have looked into other options which could’ve been BSL. Throughout my childhood, my parents worked tirelessly day and night with me, repeating words over and over again which has resulted in the standard of speech I have today and contributed to the success I have achieved throughout my education. I’m happy with my parent’s decision to go down the oral route. I understand it is a big debate in the Deaf community, but isn’t it better to learn BSL now than not at all? I know I have been extremely fortunate with the opportunities I have had and the support I have been given, while many others have not been so lucky. I have a little residual hearing, which can be amplified which has allowed me to her speech. Now I know some BSL, I can have a conversation with BSL users and it comes in handy in noisy situations! I have recently passed my Level 1 BSL exam which I’m chuffed about! I am looking to do BSL Level 2 soon. Learning this wonderful language has opened up so many doors, has allowed me to have a conversation with other D/deaf people and to make lots of new friends. My deaf boyfriend has also passed BSL Level 2 and wishes to work with D/deaf children. It’s fantastic that we have another method of communication that we can use between us. Sign Language has given me the opportunity to be a part of both the Deaf and Hearing world. I’ve never been more proud to be deaf! 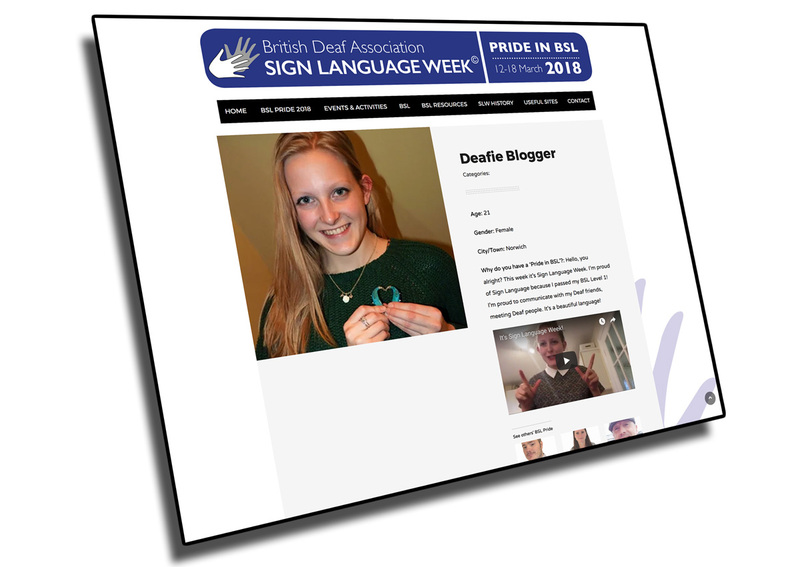 You can also find me on Sign Language Week website – tap here! I’d love to hear your story, please comment it below. Brilliant to read this as tonight I’ve just sat my final BSL level one exam! I used to know a bit of BSL as a toddler but after changing schools at the age of 6 it was all oral as it was the case in those days. I love using BSL and think it’s a great clarifier to oral. I’m profoundly deaf and getting a bit old at 58 yrs old but nevertheless don’t think it’s too late to learn BSL. Given that Alzheimer’s rears it’s ugly head more easily in the deaf due to lack of hearing to stimulate the brain it becomes ever more important to learn new skills especially as I struggle more to hear and understand people as I grow more deaf. The brain is like a sponge literally in that if you don’t use it, it loses it’s elasticity. Good luck with your learning of BSL young lady. Your world is expanding fast!